If you're like us, you might've looked at a globe of the Earth in elementary school long before the days of Google Earth and wondered just what that strange looking figure eight thing on its side was. 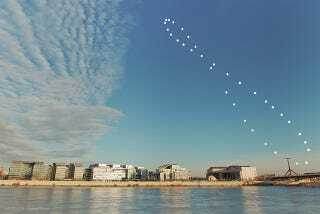 Above: An analemma of the Sun, taken from Budapest, Hungary over a one year span. (Courtesy of György Soponyai, used with permission). Chances are, your teacher had no idea either, and you got an answer such as "it's a calendar, kid" based on the months of the year marking its border. In a vague sense, this answer is correct… sort of. That funky figure eight is what's known as an analemma, and it traces out the course of the Sun in the sky through the year as measured from a daily point fixed in apparent solar time. But try explaining that one to your 3rd grade teacher. Turns out, measuring the passage of time isn't as straight forward as you'd think. Our modern day clock and calendar is a sort of compromise, a method of marking the passage of time in a continuing battle to stay in sync with the heavens. For most of history, the daily passage of time was denoted by the Sun. Solar Noon occurs when the Sun stands at its highest elevation (also known as its altitude) above the local horizon when it transits the north-south meridian. The trouble is, the passage apparent solar time doesn't exactly match what we call solar mean time, or the 24 hour rotation of the Earth. In fact, this discrepancy can add up to as much as more than 16 minutes ahead of solar noon in late October and November and over 12 minutes behind it in February. This is worth bringing up this week because this factor, known as "The Equation of Time" — think "equation" in the sense that sundial owners must factor it in to make solar mean and apparent time "equal" — reaches its shallow minimum for 2014 this Saturday at 7:00 UT/3:00 AM EDT with a value of -6.54 minutes. So, what gives? Why won't the pesky universe stay in sync? Well, the discrepancy arises from two factors: the eccentricity of the Earth's orbit, or how much it deviates from circular and the obliquity of the ecliptic to the celestial equator, think the tilt of Earth's axis. Of the two, obliquity is the major factor, with eccentricity playing a minor but measurable role. And remember, we move slightly faster in our orbit in January near perihelion as per Kepler's Laws of planetary motion than at aphelion, which occurred earlier this month , though be careful not to confuse the term "faster" with "sun fast." It's also interesting to note that the two each major and minor minima of the Equation of Time roughly coincide with the four cross quarter tie in days of the year (marked by Groundhog's Day, May Day, Lammas Day and Halloween, respectively) while the zero value points fall within a few weeks of the equinoxes and solstices. A "globe sundial" on the University of North Dakota at Grand Forks campus. (Photo by author). So, why should we care about the Equation of Time in the modern atomic clock age? It is true that there have been calls over the past few years to "abolish the leap second" and go off of the astronomical time standard entirely… if this ever does come to pass, some future Pope Gregory will have to institute a "leap hour" circa 10,000 A.D. or so to stop the Sun from rising at 2 AM. But some modern day Sun tracking devices (think heliostats or solar panels) do in fact use mechanical timers and must take the equation of time into account to maximize effectiveness. Farther afield, the effects of the Precession of the Equinoxes will also tweak the dates of the Equation of Time values a bit. Live out a full 72 year life span, and the equinoctial points will have drifted along the ecliptic by about one degree, twice the diameter of the Full Moon. Incidentally, the failure to take Precession into account is yet another spectacular fail of modern astrology: most "houses" or "signs" have drifted in the past millennia to the point where most "Leos" are in fact "Cancers!" This post by David Dickinson originally appeared at Universe Today. It has been republished with permission.